Mega-successful author Jennifer Weiner, a fervent supporter of women writers, has taken the New York Times to task for favoring male authors on a number of occasions. Now — finally — she has an ally at the paper: awesome new public editor Margaret Sullivan, who risked what we're sure is some internal backlash from her male peers by berating a Times Magazine writer for being sexist. When Goldman interviewed Tippi Hedren for the magazine's "Talk" column last week, he asked her whether she made a movie about Alfred Hitchcock sexually harassing her for "revenge" purposes and whether she had ever considered "sleep[ing] with less powerful directors for advancement in show business." (You know, normal questions that any interviewer would ask a male actor.) In response, Weiner wryly tweeted, "Saturday am. Iced coffee. NYT mag. See which actress Andrew Goldman has accused of sleeping her way to the top. #traditionsicoulddowithout," in reference to Goldman's history of asking quite a few notable women similarly obnoxious (and offensive) questions. Is it ever acceptable for a journalist to ask a successful woman if she has slept her way to the top? If he does, and a female reader criticizes him for it, is it a forgivable offense for him to suggest that she is complaining only because she wishes that she, too, could have had that opportunity? Can you believe we're talking about this in 2012? And that the journalist in question writes regularly for the New York Times Magazine? We don't publish material we believe to be misogynist or sexist. The blog post you sent me cited 3 examples, out of probably a thousand published questions that Andrew has asked since he took over the column. In the context of the full interviews, none of them struck me as sexist or misogynist. There were frank, sensitive questions, not declarations or assertions of his own. In the Terry Gross interview, Andrew is not making his own presumption about her sexuality. He is referring to an anecdote that was published in the introduction of her own book, which was made even clearer when she makes a joke about how widespread this misperception is. The Whitney Cummings question is perhaps a little cheekier but still refers to something other people have said about her - "On those Comedy Central roasts, your fellow comedians liked to joke about how you slept your way to fame. How accurate is that criticism?" 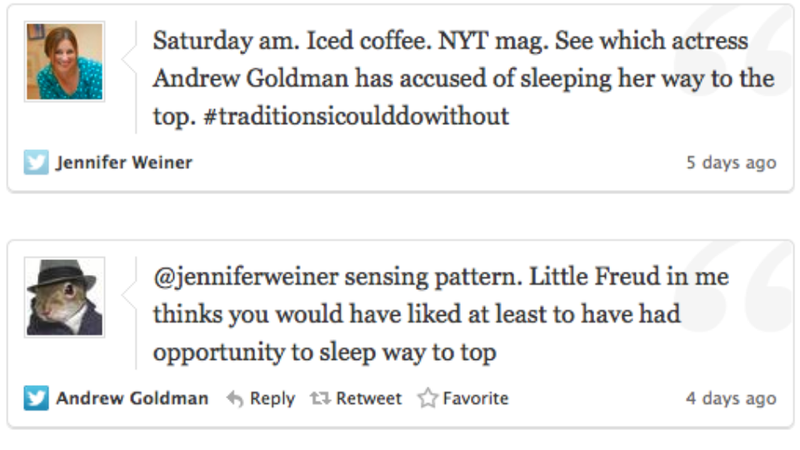 I talked by phone with Jennifer Weiner on Wednesday. She said that she enjoyed some of Mr. Goldman's work but had found some of it offensive. "I don't see myself as a humorless, schoolmarm-y scold approaching the Magazine with a highlighter in hand," she said. "But Andrew Goldman is sometimes on the wrong side of the really offensive line." And when she found fault with his question to Ms. Hedren, "the response shouldn't be ‘shut up, you're ugly, and no one wants to sleep with you,' " she said. "He is talented, and funny. I would like to see him do his job better," she said. It sounds as though he's going to get that chance. Given his misbehavior on Twitter and his status as a highly replaceable freelancer, I think his editors are extraordinarily generous to give it to him. And, given the level of obscenity and hideous misjudgment in Mr. Goldman's Twitter messages, a clear social media policy at The Times may be in order. We'll venture a guess that Goldman's actions seem trifling to these men because they've never had to deal with sexism while trying to prove themselves professionally. Sullivan, on the other hand, likely has — and, as she promised when she first got her job, she's bringing her experiences as a woman to the table. We're so happy to see she's already keeping her word.